What's better than a boozy, refreshing no bake Frozen Margarita Pie with pretzel crust for Cinco de Mayo? Nada! Try this fairly easy recipe for a perfectly balanced sweet, tart and salty dessert. I happen to make mine gluten-free with Glutino pretzels and Kinnikinnick graham cracker crumbs for the crust but use whatever you like. For the crust: Line a 10-inch pie pan with parchment paper (leave some parchment paper hanging off the sides for easy removal). Set aside. For the filling: Place the lime, zest, egg yolks, cornstarch, sugar, butter, vanilla and salt in a saucepan. Whisk to combine. Heat over medium heat while whisking continuously until the butter melts. Change over to a spatula and stir continuously to prevent the mix from curdling/scrambling. Heat the mixture further until it thickens and coats the back of the spatula. Make sure to stir at the edges of the saucepan as well, so that the lime curd doesn’t catch the bottom. This should take no more than 10 minutes. When the frozen margarita pie has completely hardened, you can prepare the meringue. For the Meringue: Place the egg whites, sugar and salt in a clean and dry (preferably metal) bowl. Bring some water to a simmer in a saucepan, and then place the metal bowl with the egg whites, over the simmering water. Whisk continuously until the sugar has dissolved in the egg whites. Be careful not to let the water contaminate the egg whites. Top the margarita filling with the meringue, creating swirls and peaks with the back of a spoon. The margarita pie can now be stored in the freezer for a few hours with the meringue topping. Using a blow torch, caramelize the meringue just before serving. Slice the frozen margarita pie into slices (use a warm knife for clean, neat cuts). Today is the 144th annual Kentucky Derby in Louisville and what's a more fitting dessert for the horse races than Derby Pie? Unfortunately the name Derby Pie is trademarked by Kern's Kitchen the folks who invented the pie in 1950. They've been known to go after anyone using the name so various adaptations of the pie have been renamed Thoroughbred Pie, Not Derby Pie, or Kentucky Dirty Pie to name a few. 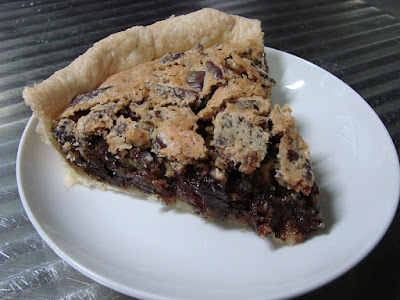 The historic dessert is a crust filled with walnut and chocolate chip sweetness that when baked is reminiscent of melted, gooey chocolate chip cookie goodness. Make it "dirty" by adding a splash of Bourbon. Par-bake the crust: Place the crust in a pie plate and prick the bottom with a fork. Cover lightly with a sheet of foil, pressing it gently into the crust and making sure the edges are covered. Place weights (metal pie weights or dried beans) on the foil to weigh down the bottom and hold up the sides of the crust. Bake for 10 minutes, then remove foil. Continue baking until the crust is firm and has lost its sheen but is not browned, about 5 more minutes. Remove from the heat and set aside. For the filling: In a medium bowl, combine the butter, eggs and vanilla extract. Add the brown sugar and flour and mix until thoroughly blended. Using a rubber spatula, fold in the walnuts and chocolate chips. Pour the batter into the crust. Bake until puffed and golden brown, about 30 minutes. Remove from the heat and place on a rack to cool. Serve warm. The first time I made Crack Pie was in 2010. I saw the recipe in the Los Angeles Times and I wanted to know what a $44 pie tasted like. It was good, real good. Sweet and addictive. You couldn't help but go for more. Again and again. I made Crack Pie for the second time yesterday. The recipe yields two pies. Just in case you need a backup. You will. Don't tell me I didn't warn you. In a medium bowl, sift together flour, baking powder, baking soda and salt. In the bowl of a stand mixer using the paddle attachment, or in a large bowl using an electric mixer, beat the butter, brown sugar and sugar until light and fluffy. Whisk the egg into the butter mixture until fully incorporated. With the mixer running, beat in the flour mixture, a little at a time, until fully combined. Stir in the oats until incorporated. Spread the mixture onto a 9-inch-by-13-inch baking sheet and bake until golden brown and set, about 20 minutes. Remove from heat and cool to the touch on rack. Crumble the cooled cookie to use in the crust. Combine the crumbled cookie, butter, brown sugar and salt in a food processor and pulse until evenly combined and blended (a little bit of the mixture clumped between your fingers should hold together). Divide the crust between 2 (10-inch) pie tins. Press the crust into each shell to form a thin, even layer along the bottom and sides of the tins. Set the prepared crusts aside while you prepare the filling. In a large bowl, whisk together the sugar, brown sugar, salt and milk powder. Whisk in the melted butter, then whisk in the heavy cream and vanilla. Gently whisk in the egg yolks, being careful not to add too much air. Divide the filling evenly between the 2 prepared pie shells. Bake the pies, one at a time, for 15 minutes, then reduce the heat to 325º F and bake until the filling is slightly jiggly and golden brown (similar to a pecan pie), about 10 minutes. Remove the pies and cool on a rack. Refrigerate the cooled pies until well chilled. The pies are meant to be served cold, and the filling will be gooey. Dust with powdered sugar before serving. NOTE: If you don't have 10-inch pie tins you can substitute with two 9-inch pie tins but the pies will require additional baking time due to the increased thickness of the filling, about 5 minutes.